Are you ready to witness the greatest Grateful Dead cover band in the world at the iconic Red Rocks venue?? 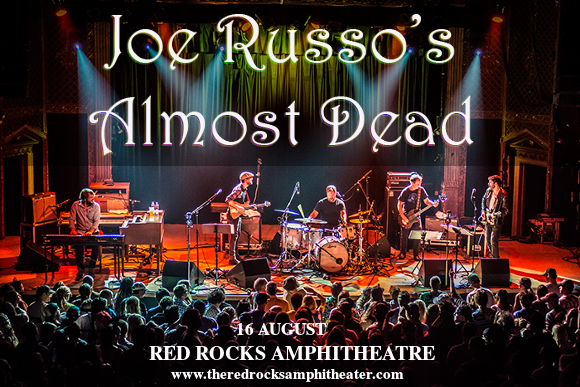 That’s right, Joe Russo's Almost Dead once again comes to the Red Rocks Amphitheater on Thursday 16th August 2018 for a show that will blow you away! Tickets for this incredible show won’t last long so don’t wait about to get yours – be speedy on that “Buy Tickets,” button!! With the approval of Phil Lesh and Bob Weir, Joe Russo’s Almost Dead are one of the top Grateful Dead cover bands out there – and that’s saying something, as there are a lot of them! Previously of Further, a band which had included Dark Star Orchestra (possibly the other greatest Grateful Dead Cover band in existence) guitarist John Kadlecik, Joe Russo decided to take the Grateful Dead covers forward into his next project. Known for their unique improvisational take on the Grateful Dead’s material, with a natural onstage chemistry that just draws an audience in, Joe Russo’s Almost Dead is less of a straight-up cover band and more of an all new Grateful Dead experience. You can’t afford to miss it! For the last few years, since they first opened for Umphrey’s McGee at the Red Rocks Amphitheater in 2016, Joe Russo’s Almost Dead have been making annual appearances at the most breathtaking venue in the world. We can hardly wait to see them again – if you can’t wait either, then hurry and grab those tickets while they last! !